The Woods Hole Public Library is having an exhibit titled “Renewal” this summer. 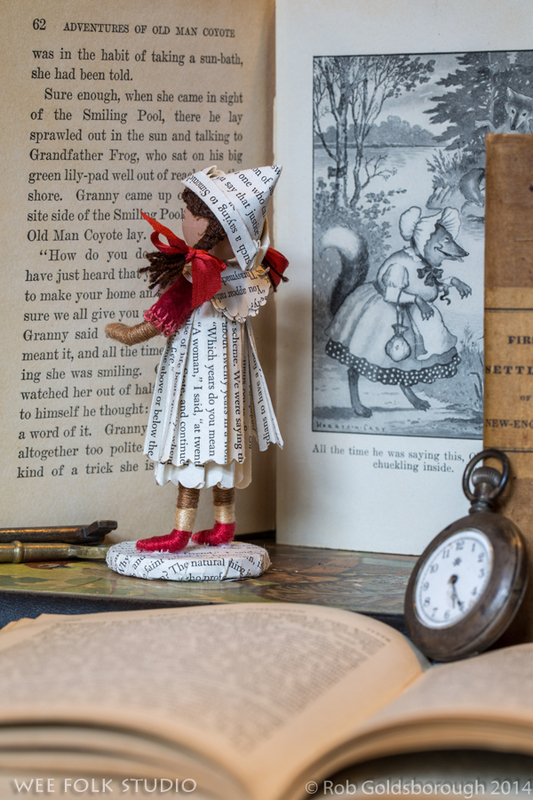 Patrons and friends were invited to make something out of old books that would otherwise be thrown out. A couple of months ago, Margaret, the head librarian asked me if I thought this idea would be supported by the community. I said, “definitely yes”. But, I wasn’t even sure if I would have time to make something for the exhibit. 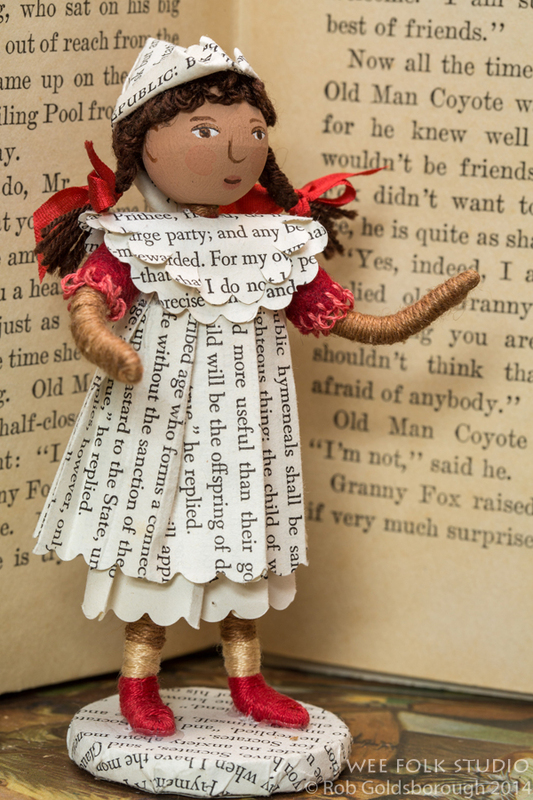 Last Thursday, I found myself caught up with tasks that need immediate attention and devoted the afternoon to making a little doll dressed in clothes made from the pages of a book. My contribution, Paige Turner was just delivered to the library via bicycle. 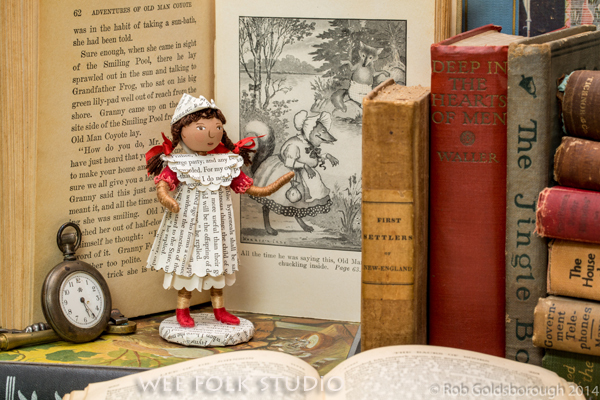 Before we brought her to the library, Rob and I had such fun setting her up in different bookish scenes at home. Paige and the other artwork made from recycled books are being offered in a silent auction to benefit the library. If you’d like to make a bid, please send the library an e-mail. Bidding via e-mail ends on July 31st at 7:00 pm (EST). This entry was posted in Dolls, Exhibits, Woods Hole by Salley Mavor. Bookmark the permalink. Oh, Sally, she is just darling! How I would love to have a doll like her. How cleverly you posed her with one of my favorite books from the Mother West Wind stories, penned by Cape Cod’s famous author, Thornton W. Burgess. Splendid! I can hardly wait to share her on my Michaelmas Press FBook page. I’m glad you like her, Pamela and was wondering if anyone would recognize the book. We have a whole set of old Thornton Burgess books that Rob’s father had as a boy. She is so cute and her name is fabulous! Salley, you, and only you could come up with this amazing idea, I simply love this little doll. As for the name – just perfect! Thank you Jenny! As for her name, I came up with Paige and my husband Rob thought of Turner. There’s got to be a real Paige Turner somewhere in the world. A woman named Paige who falls for a Mr. Turner? Oh my goodness – this is just so fun! My daughter and I have a little “Bookish” space at our local antique mall – I buy vintage books and things to sell, and she crafts things to sell from damaged pages of old books and music. Books in any form are such treasures. We love your little “Paige Turner”! I second, third and fourth all comments re: the darling Miss Turner and her clever name. I adore her stylish ecru frock accessorized with red! p.s. Speaking of clever names, my mother-in-law “Rose” married a Mr. Bloom! 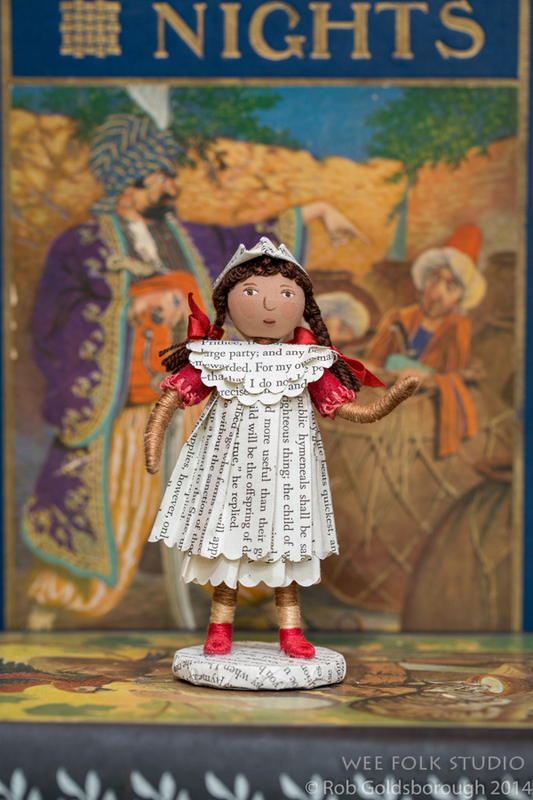 What a neat idea, what a wonderful doll, and The Mother West Wind stories were the favorites of my youth…I read them all from our local library. Love your creation, AND her name! When I saw the email posted, under “Paige Turner”, it truly made me wonder. It was such a pleasure to see Paige and to learn what she is all about. I hope the entries do very well and that the library benefits in a great way. Hopefully, I’ll get involved too. Thank you again, for posting this and for finding time to create Paige.